More than 120 years of constant hard use and service (and the neglect the Lighthouse had endured since being decommissioned in 1994) had left the main structure and quarters in need of extensive repair and conversion to a new public use. 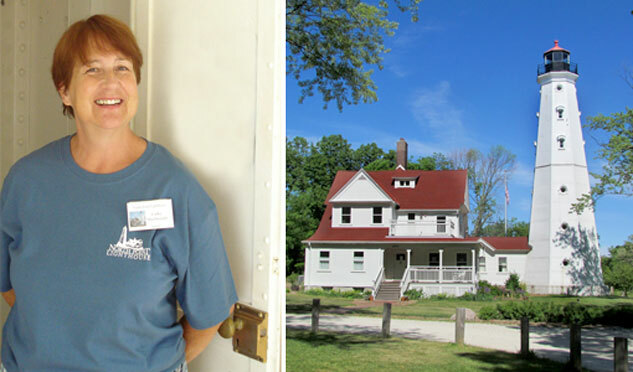 The Keeper’s Quarters required complete interior renovation for exhibitions and meeting space, and exterior restoration of the lighthouse tower, along with a refurbishing and renewal of landscaping. Fortunately, dedicated community residents and volunteers have not only restored this historic treasure but have created a new community resource for both children and adults. With your help, North Point Lighthouse Friends will continue its success in preserving and maintaining this historic property for your use. Artifacts, artwork, and photographs of the original 1855 lighthouse and old Lake Park, and marine memorabilia (including some on loan from the US Coast Guard, the Wisconsin Marine Historical Society, Milwaukee County Historical Society, Wisconsin Historical Society and Milwaukee Public Library) are displayed in the main gallery and library/boardroom, and the lighthouse tower. The first-floor gallery and the library/boardroom on the second floor are available for educational programming and special events and also for the neighborhood and community. The first-floor gallery, the library/boardroom, as well as the grounds, are available for private rental during non-public hours to nonprofit groups (at a discount) to corporations and private individuals. These entities have used this attractive, historic setting for fund development, retreats, informational meetings and conferences as well as small weddings and special parties. Please contact us at keeper@northpointlighthouse.org or 414.32.6754 for reservations and more information. View our rates. Docent-led tours of the Keeper’s Quarters and the Tower are available by appointment on weekends at a minimum group rate and during scheduled public hours of operation, currently Saturdays and Sundays from 1-4 p.m.